In June 1998, a community website for Brookmans Park and the parish of North Mymms was launched. It provided a focal point for local information and debate for 20 years. This is the story of a news site and local discussion forum that won national awards and commendations for its service to the community. 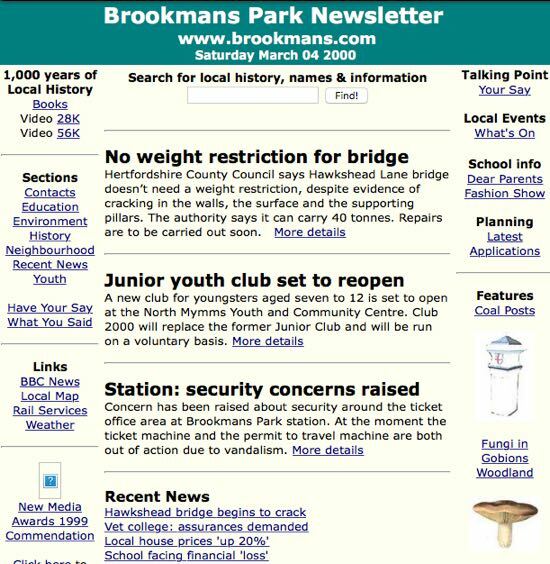 I started to build the Brookmans Park Newsletter in the autumn of 1997 in an effort to learn how to code and manage a website. It took about six months to set up. I taught myself raw HTML, and set about scanning old history books, articles, and local information in order to populate the site with valuable reference material. The former North Mymms Local History Society and former Gobions Woodland Trust were a great help at that time, as was local ornithologist, Rupert Pyrah who shared his research into local bird life. An early mention of the site was on page three of the North Mymms Local History Society newsletter of November 1998, written by Terry Pennell. Another local resident, James Bentall, offered to pitch in on the technical side. James wrote many of the more complex website scripts that provided much of the interactivity on the site. Over the next 20 years James became the go-to person for correcting any technical disasters that my coding created, pitching in to fix the site any time of the night or day, sometimes from a tent in a muddy field where he was running scout or youth club activities, sometimes from the train on his way to and from work. The original site was created using free web space offered by Pipex, my dial-up internet provider at the time. The site had the complex URL of http://www.dj09.dial.pipex.com. I then moved the site to The Positive Internet Company, and registered the URL www.brookmans.com. Positive hosted the site, free-of-charge, for almost 15 years and would have continued to do so, but I felt the site should be financially self-sustainable. Google adverts were added and the income from those covered the costs and allowed for donations to be made to Kiva - Loans That Change Lives from any surplus. 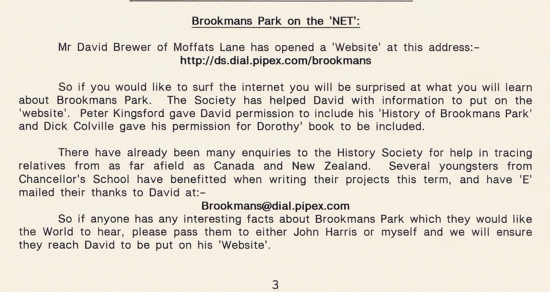 The first story to be published on the Brookmans Park Newsletter was uploaded on June 27, 1998. It was about the fairness of the admission policy for the local secondary school, Chancellor's. It was the first of almost 1,000 local news stories written for the site over a 10-year period. In 2008 we stopped producing news stories and, instead, relied on the community to provide news updated via a new interactive forum. I was working as a journalist at the BBC at the time we launched the site. 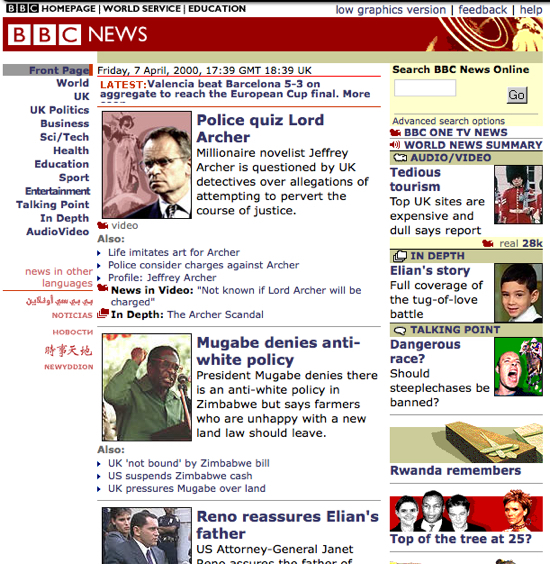 In the summer of 1997, the BBC's Director General, John Birt, decided that BBC News needed to have a website. I was one of the editors tasked with building BBC News Online, the BBC's first global online news presence. 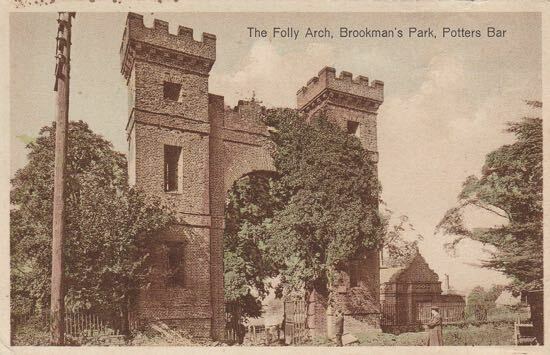 As the then UK Editor, I was working during the day on the BBC site, and, when I got home in the evenings, I was working on the Brookmans Park Newsletter. Birt gave us six months to build the BBC site. CNN and the Electronic Telegraph were the main competition. A small team of BBC journalists was chosen and, along with our technical colleagues, we camped out on the 7th floor of BBC TV Centre in London’s White City, and began work. The BBC already had a political news site set up to cover the 1997 election, so we started to adapt that and test out new ideas as we built the news site alongside. Although in charge of the UK editorial side, I wanted to learn more about how websites worked, so I tried out some of the early site navigation plans for BBC News Online on an unsuspecting Brookmans Park audience. I wanted to be sure I understood the concepts being spoken about by my technical colleagues. I also wanted to know how the stories my team of journalists were writing were transformed into beautiful web pages. I was keen to understand user behaviour, website navigation, and how news stories could be adapted for an online audience. Apologies for using the local community as a test bed for those ideas. Unfortunately, I don't have any screen grabs of the first front page of the Brookmans Park News Letter in 1998, but below is a screen grab of the site in early 2000, along with a screen grab of BBC News Online taken around the same time. It is a poor imitation of the real thing, I know, but you can see how I tried to copy the basic layout. Back at BBC News Online, I was also one of those responsible for revising the BBC Editorial Guidelines for the new online world. I adapted those guidelines for the Brookmans Park Newsletter, covering such issues as taste, decency, offence, privacy, abuse, tone and language, diversity, and commercial promotions. At times I might have been too keen in enforcing those rules and, in doing so, I might have stifled debate. But I always felt that a site without clear standards could quickly deteriorate and lose its integrity. Apologies to all those forum members and friends I may have alienated along the way. Work on the BBC news site was progressing nicely alongside the old Election 1997 site; we were five months from launch. Work on the Brookmans Park Newsletter was coming along fine, too. I’d scanned in a few books for the local site’s history section - each page took about five minutes to scan and half an hour to format. Local resident Bernard Spatz was always on hand to help me proof read material that had been scanned using early optical character recognition (OCR) software. Bernard became an unofficial revise sub-editor for the site, popping printouts of corrected pages through my door at all hours of the day and night. I continued to spend my days working on BBC News Online, and my evenings - and any free time I could find - transferring that knowledge to the Brookmans Park Newsletter. In the early hours of August 31st I was woken by a phone call from the overnight team working on the yet-to-be-launched BBC News site telling me that there had been a road traffic accident in a tunnel in Paris involving Diana, Prince of Wales. I drove to our offices. We turned the existing Election 1997 site into a news site and began covering news updates as they came in. By daybreak, website traffic was growing beyond all expectation, and to levels that we had failed to prepare for. Somehow, a fledgling online audience had found us, saw that we were posting updates, and was refreshing pages looking for new information. Our servers began to creak. At that point we realised we had to continue with the news updates and that we didn’t have enough staff to take over. Many of us worked for the next 48 hours non-stop, some catching what sleep they could under their desks on the newsroom floor, grabbing coffee, and starting a new shift. And that was when it dawned on us, audience demand for on-going coverage of the event in Paris meant that we had already launched BBC News Online - the BBC's first 24/7 rolling news service - almost five months ahead of schedule. We also realised that we needed more staff, bigger servers, more desks, and staff training in how to write for the web and respond to breaking news online. I was asked to become the managing editor, taking charge of editorial, staffing, and logistics for this newly-launched continuous news flow. In the evenings I would return to Brookmans Park to continue my work on the new site I was building with the help of James and Bernard. Two years later, CNN asked me to be the managing editor for the launch of the first international version of CNN.com outside the USA, and three years after that I was helping launch Al Jazeera English in Doha. All the time I was attempting to transfer what I was learning to the Brookmans Park Newsletter. But it wasn't all one way traffic. In my later media development work in Africa and Asia I was able to share some of the lessons learnt building the Brookmans Park Newsletter with the independent media houses I was helping, including sites in Tanzania, Zimbabwe, Sudan, Ethiopia, Vietnam and Bangladesh. A number still use a forum model similar to the Brookmans Park Newsletter in order to stimulate local debate and engage their audiences. The Brookmans Park Newsletter has won a number of awards over the years, including three New Statesman New Media commendations. In 1999, the site was commended for "the use of new technology in empowering individuals locally". That was how the judges summed up the site which made it to the last three out of hundreds nominated. In 2000, we won the New Statesman’s Overall Merit Award outright for having, apparently, "served the public interest in developing a democratically accountable civil society during the previous 12 months". We beat the BBC News Online team competing in the same category. I remember my former BBC colleagues being seriously unimpressed. In 2004, The Brookmans Park Newsletter came second, out of 100 nominations, for the New Statesman Community and Information Award, again BBC News Online entered the same category but failed to make the top three. Also in 2004, the site was mentioned as having played a part in helping Brookmans Park win the Hertfordshire Information Communication Technology Village of the Year 2004 Award. From the start we tried to engage the Brookmans Park audience in debates about local issues. Our motto has always been “Content created by the community for the community”. We didn’t want it to become a platform for politicians to promote themselves, for public relations companies to spin a line, or somewhere where commercial companies could get a free plug. At first we had a 'Have You Say' section where people could raise topics and invite others to discuss them. In 2005 that format was replaced with a new interactive forum. The new forum peaked in 2010 in terms of new posts with 4,418. By 2017 that had dropped to 1,143. The peak for new topics was in 2012 with 482, compared with 200 in 2017. Overall, last year, 2017, was the lowest point in terms of audience engagement for almost 12 years. A survey of users in January 2018 drew 100 responses from a forum membership of 1,033. Of those, 31 people claimed to visit the site once a day, eight visited several times a day, 35 people visited once a week, and 17 of the 1000 said they rarely visit the site. 77 people thought the site serves the whole community, while 19 people thought it was too restricted and needed to open up to wider debates. 87 people thought the site would be missed if it closed, seven weren't bothered either way, and two thought the site doesn't serve a valuable purpose anymore. Some survey respondents said that the forum “encourages moaning”, can be “very parochial and closed minded”, featured “the same voices with the same bugbears”, was used by “a few people with set interests” and was “dominated by the same contributors”. 54 forum users (57% of respondents) said they prefer to watch discussions rather than take part in them. Others pointed out that such communities forums have been replaced by other social media platforms. All good points which, when combined, seemed to suggest that the forum, in its current form, may have served its purpose. Managing the forum had not been easy. And it would not have been possible had it not been for the small team of local residents who volunteered to be forum moderators. All worked under a forum alias rather than using their own names, so it would be wrong to name them here. But they all became trusted friends over the period. And they all did so well during the 12 years the forum operated. It's not easy reading every post, editing some, removing others, and then explaining to the correspondents why their contribution needed attention. And it’s not easy putting up with me; the moderators were wonderful. The cost of registering and hosting the site in 2017 was about £250 a year. In 2015 and 2016 this was easily covered by the income from the Google adverts displayed on the site. However, a drop in forum usage during 2017, with the lowest number of new topics and forum posts for 12 years, signalled a change in audience behaviour and interest in the site. At the same time, the income from the Google adverts fell sharply to the point where the site was no longer financially sustainable. The Google income, after tax had been deducted, covered less than half the annual costs. Apart from the financial issue, I was aware that when I expired, so would the site, and that something needed to be done to preserve the main content on the site. 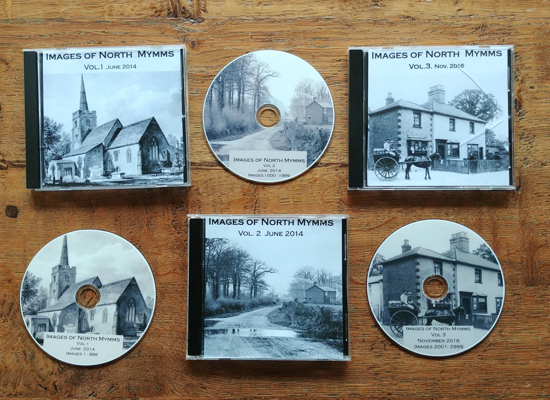 So I set about revising, improving, and transferring material from the old site's history section to a new site called The North Mymms History Project. That history site grew, with new material being added, thanks to the help of three local historians, Peter Miller, Mike Allen and Bernard Spatz. The 60 walks were moved to a new site called Hertfordshire Walker. All were updated and tested several times by me and my wife, Ellie. I also started a new site North Mymms News in order to post and archive other information from the old site, and use for posting updates regarding new material being added to the other two sites. All three new sites are built on the Google Blogger platform, so they will carry on long after I am history because they are free and not tied to registration or hosting renewal contracts which expire if not kept up. I then negotiated a fresh hosting deal with The Positive Internet Company where they would continue to host the domain www.brookmans.com and allow me a much smaller space allowance in order to promote the other sites, retain the travel and weather updates and include regular updates from the three new sites. This cost was easily covered by the Google adverts. 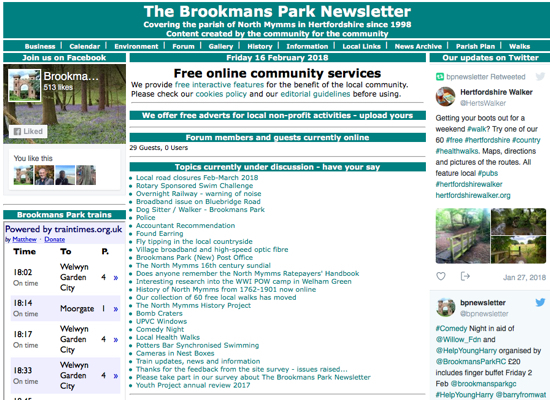 I learnt how to build a responsive template (one that works well online, on mobile and on tablet) for a new version of the Brookmans Park Newsletter. That new version of the site is scheduled for launch by the end of April. Building and running the main site for 20 years was great fun. This latest stage in the development of an online repository of information for North Mymms is proving equally challenging and entertaining. In September 2018 the name of the site changed from the Brookmans Park Newsletter to the North Mymms Newsletter to reflect better the area covered by the site. Thanks to all in the community for making the previous site such an important part of local life. The new sites, I hope, will preserve all the previous hard work and new material for the benefit of many generations to come.